Whether standing knee-deep in a field of wildflowers or crouched down in the recesses of a remote desert canyon, prior to pressing the shutter release on my camera I am thinking of two things. First, I am thinking of the way that the scene in front of me makes me feel and what part of me it is speaking to. The other thing that I am thinking about is how I can take the scene in front of me and best translate it through a digital image to a print. The ultimate goal of any image I capture in the field is to see it to fruition as an expressive Fine Art Print. The Fine Art Prints that I offer are available in a few different “standard” print mediums, each one with their own set of characteristics and price point. Below you will find information pertaining to each of the different mediums that I have selected to showcase my work. Please note that other types of prints are also available, such as Metal Prints, Plexiglas Mounts, etc., however due to the extra time involved in dealing with these “non-standard” print mediums the orders will take longer to fulfill and there will possibly be an additional cost associated with the order, please send me an email and let me know what you would like so I can get back to you with an estimated price and timeframe. All prints, regardless of the framing and matting options include a Certificate of Authenticity that will be included with the purchase. If you have any further questions regarding these print mediums please contact me and I will be happy to answer them. If for some reason the options below do not meet your needs please feel free to contact me and we can work on coming up with a solution. Traditional Fine Art Prints are made using a Fine Art Metallic Inkjet Paper, which is truly magical in it’s appearance. This paper really accentuates the depth and vibrancy of the image and helps to showcase the connection that I feel when photographing these wild and remote places. Traditional Fine Art Prints are available as Loose Prints in pretty much all sizes. This allows you to purchase a print and have it framed by your local framer to reduce shipping costs as well as better be able to match the frame to the decor of your home or office. A Loose Print means that you will receive a print signed on the front with no matting or framing done to the photograph. The print will come packaged in a plastic sleeve with a piece of board behind it to keep the photograph from bending during shipping or handling. For loose prints sized 16x24 and over they will be packaged in a shipping tube rolled up so that they are less likely to be damaged in shipping. When you receive your rolled print it is recommended to unroll the print and reroll it in the opposite direction so that it helps to flatten the print prior to matting or framing it (do keep in mind that it is best to avoid touching the image area during this process to lessen the chance of getting fingerprints on the image). Loose prints are offered for those that have specific matting and framing requirements and would prefer to have this done at a Custom Framing shop of their choice. For more information on what to do with a Loose Print please sign up for my Email List and gain access to my free PDF Downloads, including "Loose Prints - Why?" which provides more details on what to do with a Loose Print to make a custom piece to hang on the wall of your home or office. 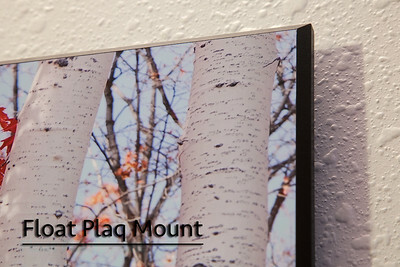 Standard Plaq Mount - The Standard Plaq Mount is roughly 3/8” thick with a 3/16” beveled edge around the image area. 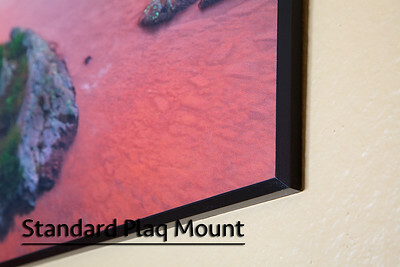 I recommend a Standard Plaq Mount for all 12x18 Fine Art Print’s, however for anything larger I would recommend moving to either a Float Plaq Mount or a Mega Plaq Mount.The standard hanging system utilized for the Standard Plaq Mount is a Keyhole Hanging System, which provides an easy and secure way to hang the mounted print on the wall. Float Plaq Mount - The Float Plaq Mount starts with basically the same mount as the Standard Plaq however a ¾” backing is applied to the back of the wood block. 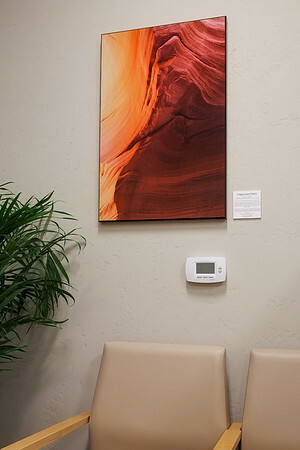 This ¾” spacer is smaller than the outside diameter of the front block therefore when it is hung on the wall it gives the appearance that the piece is “floating” on the wall. This is a very modern look and is starting to gain popularity in commercial spaces as well as gallery showings. The standard hanging system utilized for the Float Plaq Mount is a French Cleat System, which provides a very easy to install, and secure hanging system. 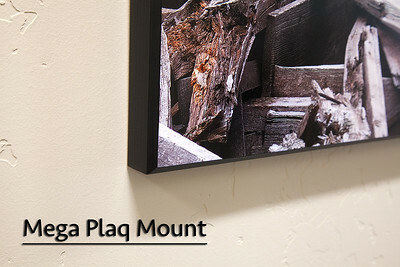 Mega Plaq Mount - The Mega Plaq Mount is basically a thicker, beefier, Standard Plaq. I prefer this or the Float Mount on any Fine Art Print over 12x18. 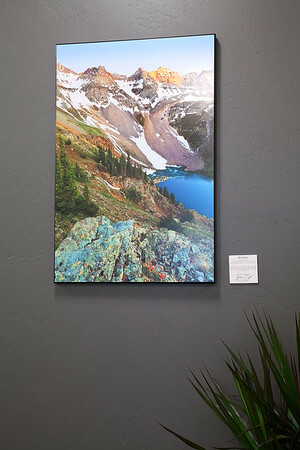 This mounting style gives the Fine Art Print a more traditional look, with a twist, providing a black border all the way around the image when viewed from the side, just like the Standard Plaq, however it is a little over an inch thick as compared to the Standard Plaq which is only about 3/8” thick. The standard hanging system for the Mega Plaq is the French Cleat System, which provides a very easy to install, and secure hanging system. All Duraplaq Mounted Print are signed on the front. If you prefer to have it signed on the back just let me know and I can make it happen. These prints will come packaged in a bubble-wrap envelope and if being shipped they will be placed in a box with padding provided to take up extra space and provide extra protection. These are quickly becoming one of the most popular ways to decorate or show fine art photography; a modern mix between the beauty and sharpness of a photograph with the display aesthetics of a painting. 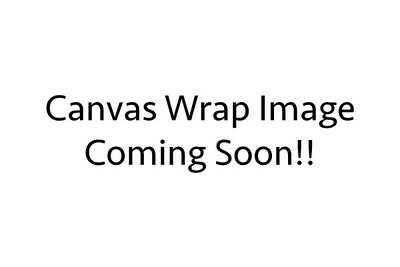 Canvas Wraps take an image and directly print the image on canvas, the canvas is then stretched over 1-1/2" eco-friendly wood stretcher bars just like a traditional painting. The sides of the Canvas Wrap are a mirrored image of the front of the piece. It is then coated with a Fine Art Protective Coating to help provide moisture and UV resistance to the print. The standard hanging system for a Canvas Wrap is a traditional wire hanger that can be easily hung from almost any wall. If you are considering purchasing three or more prints please contact me for a discounted pricing quote. I am also available for presentations, giving you some examples of the different mounting styles to look at as well as to consult on sizes and images to fit a particular space. If you are interested in using one or more images for a commercial use such as advertising, website design, editorial use, etc. please see the Stock Information section of the website for further information or contact me directly at ryan@ryancaryphoto.com.